Brandon Boyd, an oceanography doctoral student in the College of Earth, Ocean, and Environment, received a prestigious SMART Scholarship from the Department of Defense. 8:56 a.m., July 25, 2013--Growing up along Lake Pontchartrain in New Orleans, Brandon Boyd spent a lot of time hunting for waterfowl and fishing for speckled trout in marshes and swamps. There, wetlands are a way of life. “Ever since I was in high school, I knew I really wanted to do something to help protect wetlands,” said Boyd, a graduate student in oceanography in the School of Marine Science and Policy within the University of Delaware’s College of Earth, Ocean, and Environment. 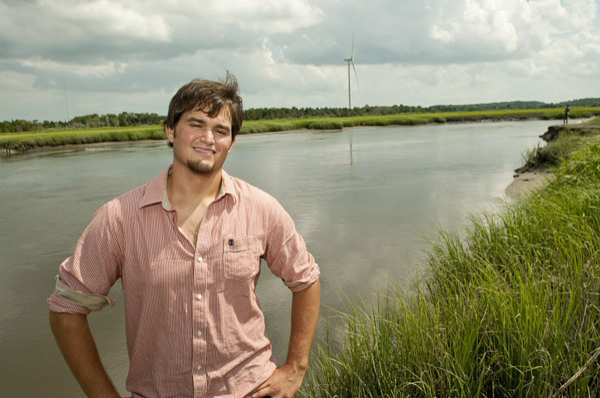 Boyd is helping to do just that with his research on coastal marsh dynamics, and he recently received a Science, Mathematics and Research for Transformation (SMART) Scholarship from the Department of Defense (DOD) to make a career out of it. The federal initiative supports students pursuing undergraduate and graduate degrees in science, technology, engineering and mathematics, with the goal of adding more civilian scientists and engineers to DOD laboratories. The competitive scholarship has three components: a stipend to support Boyd’s graduate studies, an internship to work at during his summers and a full-time job once he defends his dissertation. A graduate of Louisiana State University, Boyd is interested in how marshes develop through a combination of plant growth and sedimentation. The process, known as accretion, is significant in the context of rising sea level and shore erosion, which threaten coastal marshes worldwide. Boyd sought out UD faculty adviser Christopher Sommerfield, an expert in geological oceanography, and earned a master’s degree in 2012. He begins his second year of doctoral work with Sommerfield this fall. Sommerfield and Boyd measure marsh accretion using radionuclides, whose half lives provide “clocks” for quantifying sediment burial rates. The approach is one that the DoD is interested in adopting, Boyd said. Next summer, he will start an internship at the U.S. Army Engineer Research and Development Center’s Coastal and Hydraulics Laboratory in Vicksburg, Miss. The lab is involved in researching channel dredging, wetland surveys and remediation, and other projects. Boyd will be examining dredging operations data to better understand the effects on surrounding wetlands, especially as it pertains to sediment flow. When Boyd visited the facility last year, he was impressed by massive wave tanks, the size of buildings and the use of drones to fly Lidar, a sophisticated map-making technology involving lasers, over marshes. Overall, the lab is helping to monitor impacts that various factors  from groundwater removal to transportation to oil and gas production  have on the coast, wetlands and military operations. “As coastal change is happening, they’re hoping to figure out how to adapt under these changing conditions,” Boyd said. After finishing his doctorate, Boyd will join the lab full-time and work just a few hours from his native New Orleans.